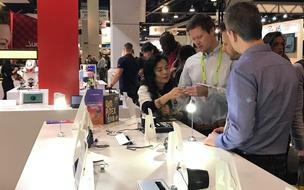 The 2019 Consumer Electronics Show (CES) in Las Vegas opened on January 8th. The organizer Consumer Electronics Association (CTA), using the theme of Welcome to the future, analyzed the industry's focus on 5G, AI and IoT that are widely used in real life. The digital voice control, especially products that support voice assistant has become the basic requirement. Mr. James Huang, Chairman of TAITRA, personally led 55 Taiwanese manufacturers to participate in the international arena to generate orders. Meanwhile, TAITRA set up three pavilions across Tech East and Tech West areas of CES to showcase innovative technologies from Taiwan Excellence, Taiwantrade, COMPUTEX d&i awards, and smart retail solutions. To present the system solutions capacity of Taiwanese companies, TAITRA has assumed the role of “Smart Integrator” by setting up a “Smart Retail Pavilion” at Westgate, integrating Taiwan beauty brands with the smart retail solutions of various high-tech enterprises to create a real beauty store. The flagship pavilion for TAITRA was located at LVCC South Hall 1 which consisted of selected cutting-edge technologies from Taiwan Excellence, Taiwantrade, and COMPUTEX d&i awards. Taiwan Excellence showcased 42 innovative technology products from 18 manufacturers, of which more than a quarter was related to AIoT applications. A press conference hosted by Taiwan Excellence, “The Future is Smart: Taiwan Innovations for 2019 & Beyond”, was held on January 7th, the day before the show opened unveiling some of the best tech and a preview of COMPUTEX 2019. Taiwantrade is the home for over 70,000 Taiwanese suppliers with 660,000 product catalogs. Its showcase at LVCC focused on "Smart Life Partner" by exhibiting a selection of 44 quality products or brochures in categories such as smart home, smart city, medical and healthcare, and e-sports products. To warm up and continue to build global technology ecosystems, COMPUTEX chose CES to showcase some of the winners of the COMPUTEX d&i awards as the first overseas promotion event of this year. A total of 41 products from 25 companies were displayed. During the show, innovations such as the world's first 360 AR/VR camera LyfieEye200 and Origami Labs' ORII voice-powered ring received many inquiries from visitors. The COMPUTEX d&i awards showcase not only helped winners to expand the international market but also demonstrated the innovation and R&D capabilities of the Taiwanese ICT industry. COMPUTEX is set to open from May 28th to June 1st, focuses on five themes AI and IoT, 5G, blockchain, innovations and startups, gaming and XR. The show attracts exhibitors from international brand names to startups to showcase the latest innovations and technologies. Along with the exhibition are a variety of highly-anticipated events such as COMPUTEX Forum where senior industry executives serve as forum speakers, updating the world audience with the tech trends and insights into the tech future. InnoVEX, the showcase for the most innovative startups, will open from May 29th-31st. The 3-day exhibit that has grown into the biggest startup event in Asia includes a series of activities such as forums, pitches, demos, workshop, business networking and more. COMPUTEX 2019 will continue its leading position of building global technology ecosystems. With expanded capacity, the addition of a brand new exhibition hall– Taipei Nangang Exhibition Center, Hall 2, it will connect even more exhibitors and visitors while bridging global startups with investors and manufacturers!